Front logo is in reasonable shape for 63 years old. Whulp, Daddy’s got a new project. 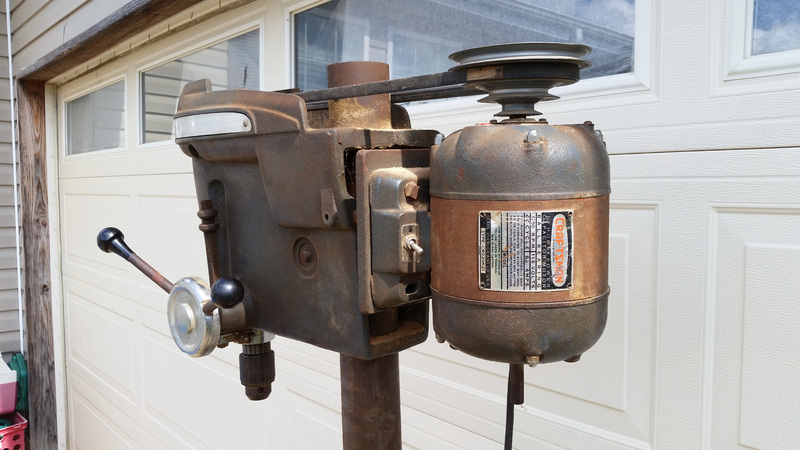 I drove down to Birmingham one afternoon and ended up picking up this Craftsman 15″ 100 series drill press, a model 103-23141, manufactured around 1953. 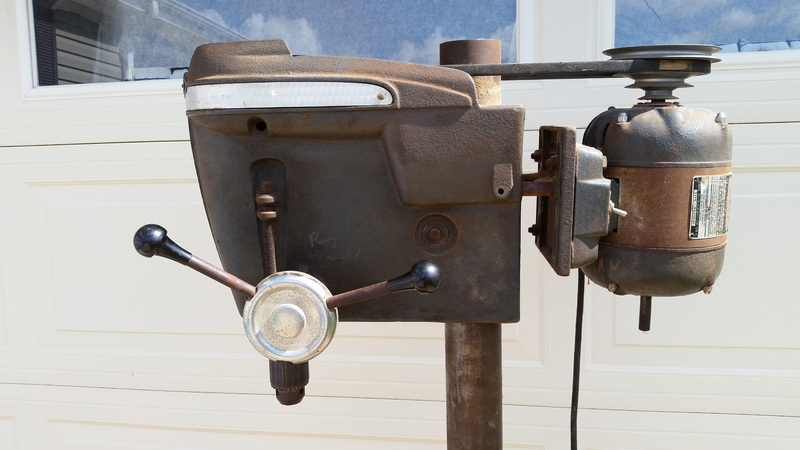 This post will be the first of a series in which I talk about the process of restoring this 63 year old drill press, hopefully preparing it for another lifetime of service. The drill press is in overall decent shape, I believe, but I haven’t torn into it yet. Below are some photos to acquaint the reader with the ‘before’ state before I start working on it and cleaning it up. 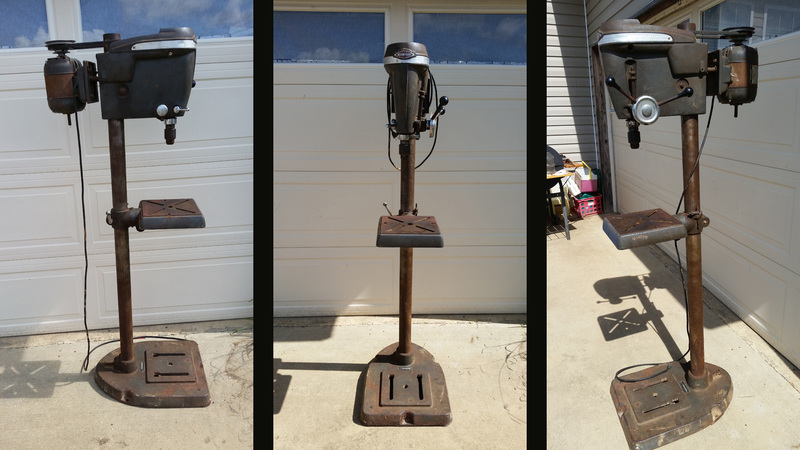 Craftsman 103.23141 sides and front view, unrestored. 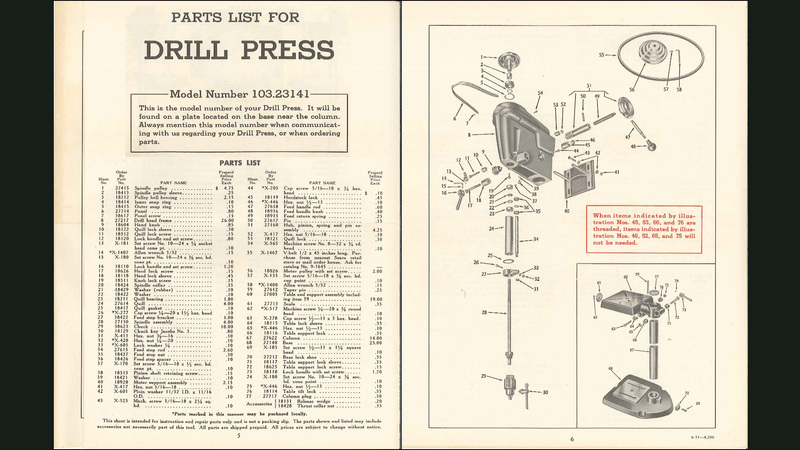 Parts list and exploded diagram for Craftsman 103.23141 (model 100) drill press. Excerpt from: original operating instructions at vintagemachinery.org. 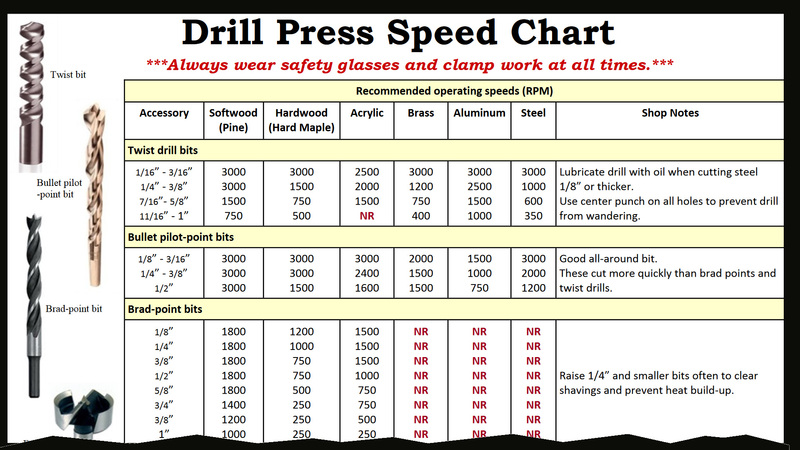 Spindle speeds chart for Craftsman 103.23141 (model 100) drill press (without multi-speed attachment). Excerpt from: original operating instructions at vintagemachinery.org. 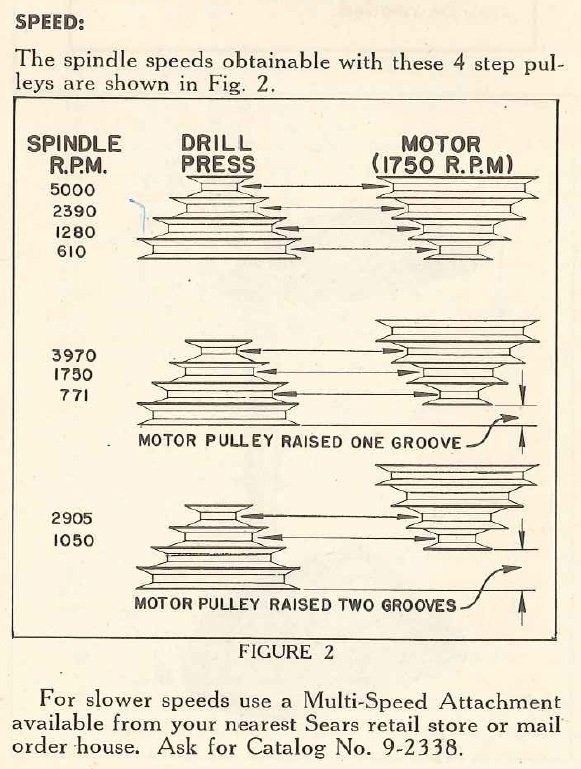 By the way, FermiLab provides a handy one page reference pdf of suggested drill press RPMs based on materials and drill bit type. Excerpt from: FermiLab. 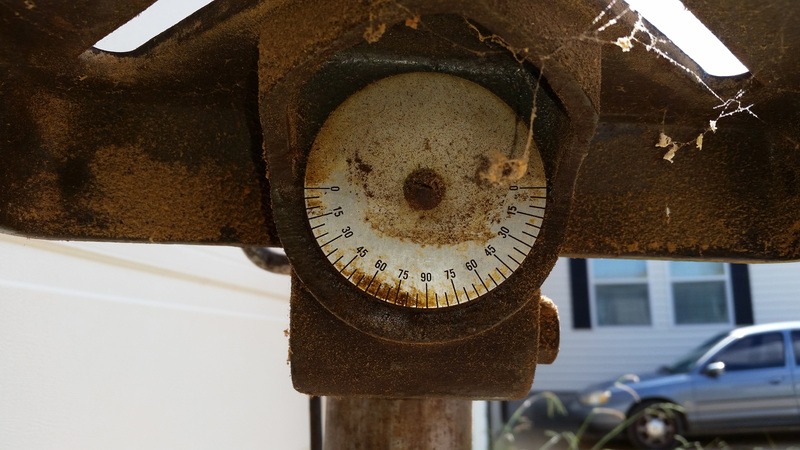 The drill press ought to handle any wood and be able to slow down enough to put holes in aluminum and steel of moderate size. The headstock lock handle is missing and replaced by a bolt. The feed return spring needs to be adjusted, but I think it’s intact. 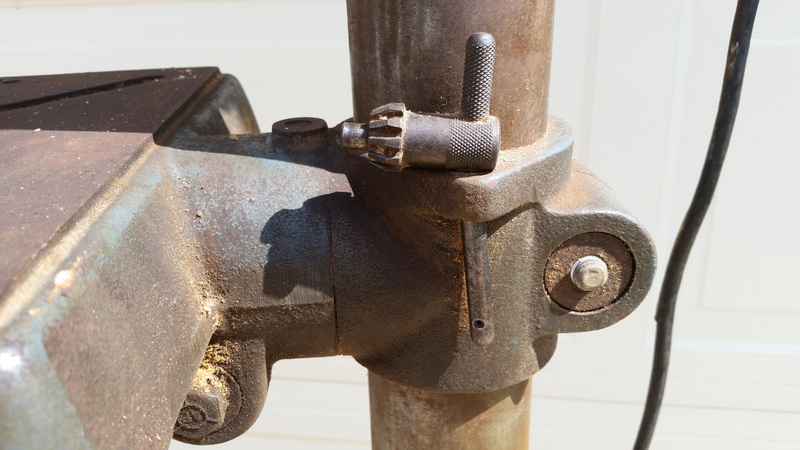 Broken feed handle arm (1 of 3). The rod is broken off inside the threaded portion, so I’ll have to either find a way to ease it out or drill and tap the hole. The base is very massive cast iron. I think the column is extending too far into the base, preventing the base from sitting flat on the ground. 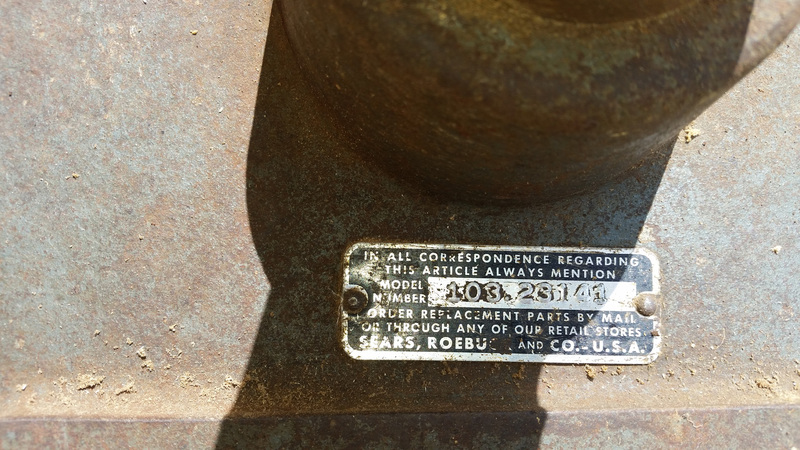 The correct column retaining bolt is missing. 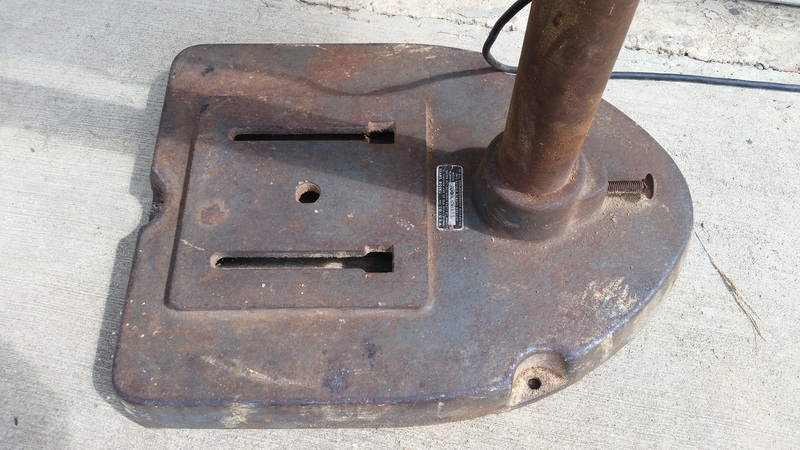 The model number was hidden under years of sawdust on the base. I brushed off the base and revealed the model number. The table on 100 series drill presses has a tilt function and a protractor is built in. The tilt feature was dropped from the later 150 series. The working surface of the table has a minimal ‘arc of shame’ – holes drilled negligently by the previous owner. 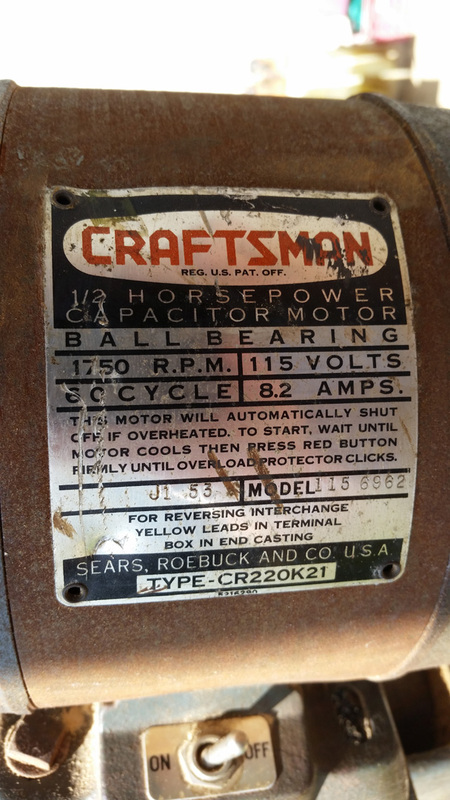 The 1/2 HP original Craftsman motor (115.6962 model, made by Packard). The J1 53 date code indicates this is a 1953 model. 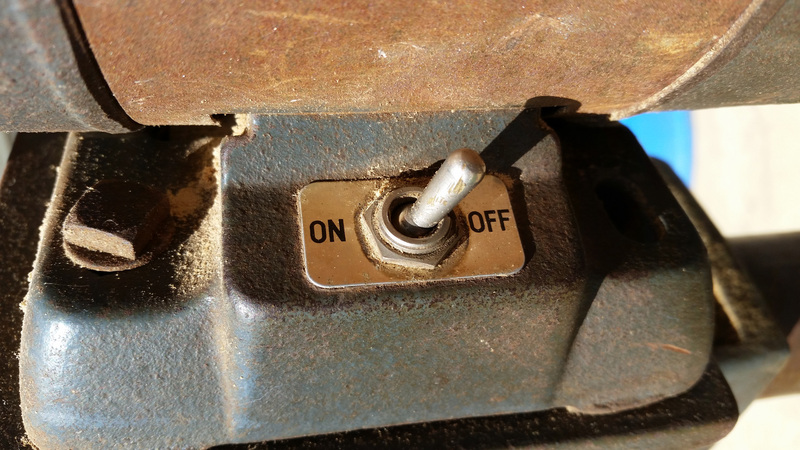 The ON/OFF switch label is the same, I believe, as on my 1958 model Craftsman bench grinder. 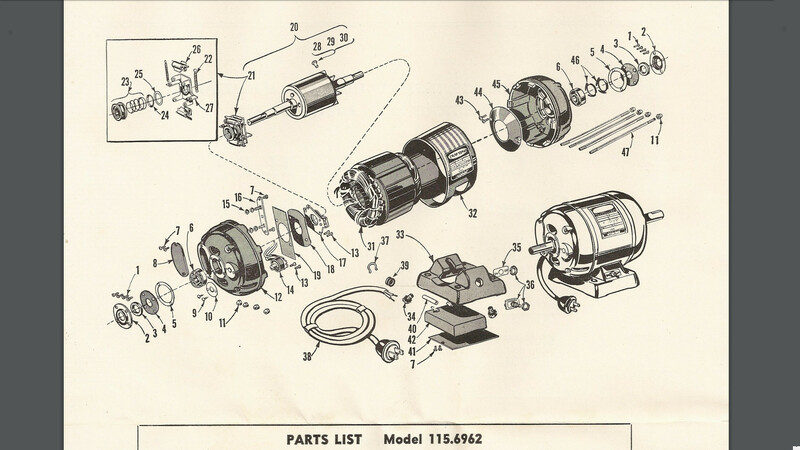 Parts breakdown diagram for the Craftsman 115.6962 1/2 HP motor. See also the parts list image that follows this one. Excerpt from Maintenance booklet at VintageMachinery.org. 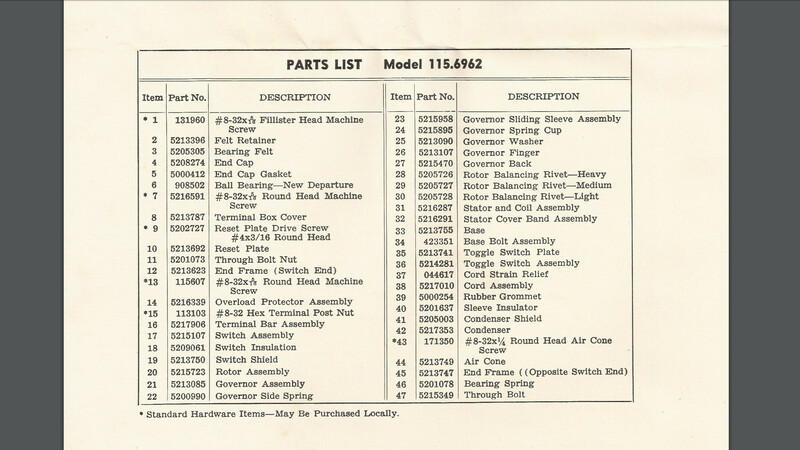 Parts list for the Craftsman 115.6962 1/2 HP motor. See also the parts breakdown diagram image that precedes this one. Excerpt from Maintenance booklet at VintageMachinery.org. The original chuck key appears to have been preserved. The chuck is a key-type, accommodating 0″ – 1/2″ bits and should have a lock collar to retain it on the spindle. The motor mount is missing one bolt of four. The belt is pretty new. Sort of a poor photo, looking down into the headstock. The video above shows the drill press running. It sounds like it is in need of lubrication. The feed stop bracket is loose and rubbing the chuck/spindle. I have the exact same drill press. My problem is finding the pulley assembly that attaches to the spindle. Sears does not have a replacement part for this model. Is there someone that has these parts. Please let me know. I have not used that company before, but someone suggested it on garage journal. Good luck and please comment and let us know here if you found what you needed (and what parts worked)! Thank you for the suggestion but they didn’t have what I need. I’ll keep looking. 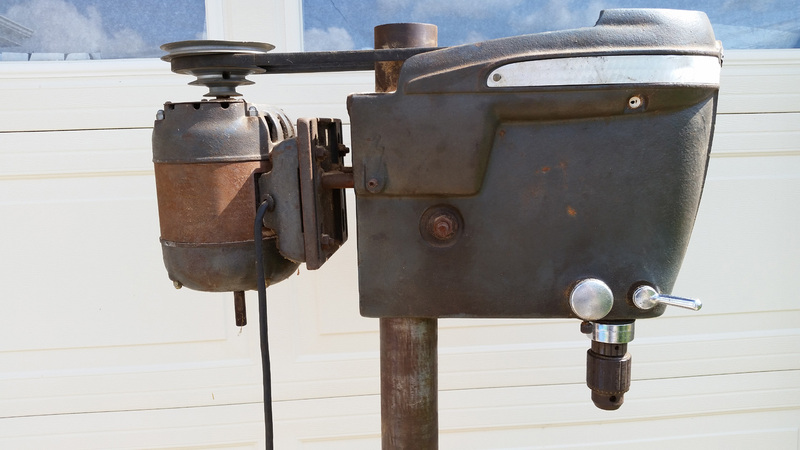 I might get lucky and find another drill press that isn’t in very good condition but has the pulley I need. Bummer! Sorry I couldn’t help more. Replacement parts can be a bear to find. Let us know here what you end up doing. Good luck and Merry Christmas! I have the same model DP.. 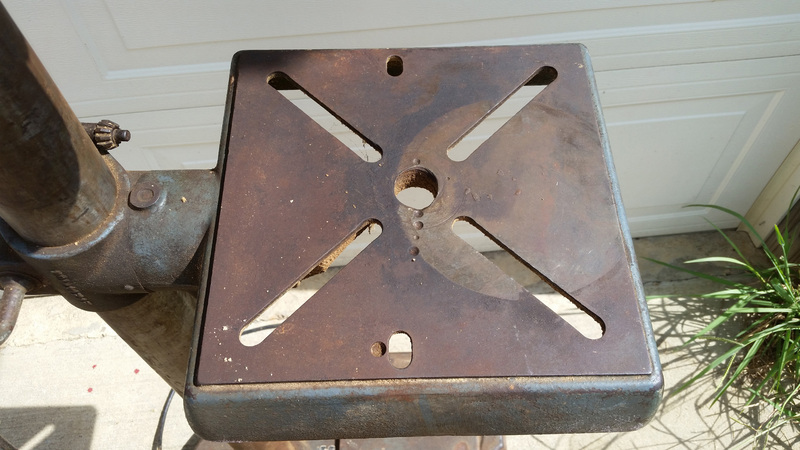 I just picked it up and have started to refurbish it … everything runs.. but when drilling steel it chatters … so I’ve taken it all apart for bearings Ts and good cleaning . Thanks for visiting! 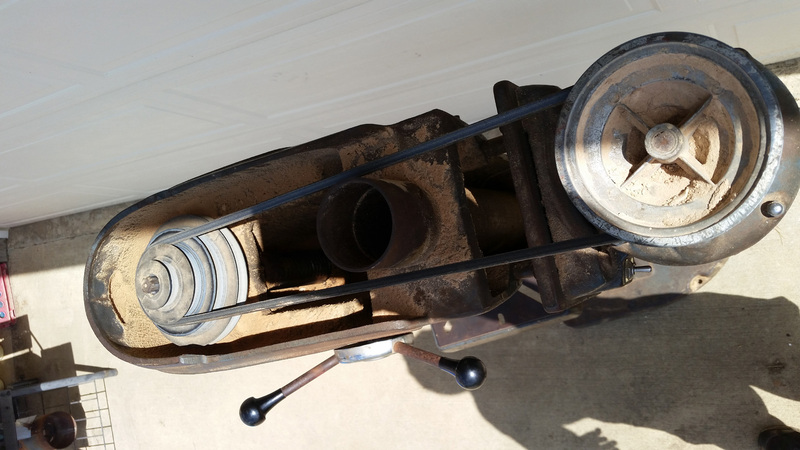 It’s probably not a bad idea to do the bearings, clean it up, etc. Are you sure your spindle isn’t bent? Chattering could also be due to your feed pressure and drill bit. Just a few things to think about. Good luck with your restoration! 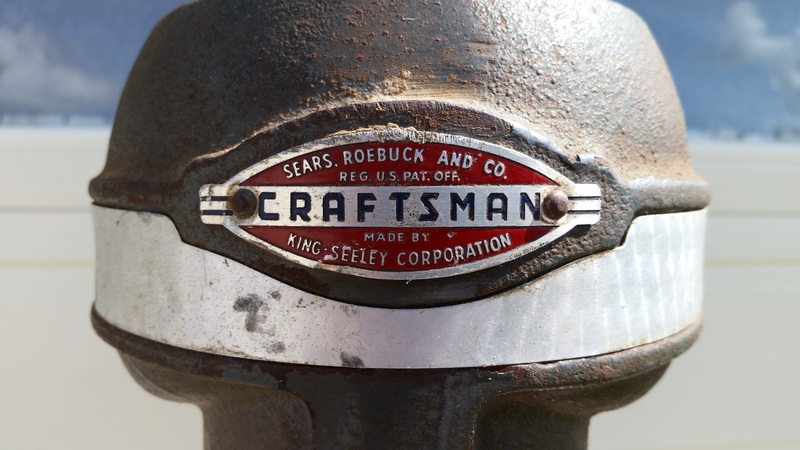 I am looking for (1) handle and knob (burgundy color) for my Craftsman 150 drill press. Does anyone happen to have one for sale? I was missing one knob, and I ended up making three knobs out of long bolts (threaded only on the last inch or so and the head cut off), that I epoxied into 1.25″ diameter hardwood balls. I don’t have any pics handy, but it was pretty easy. I forget the thread pitch, but it was a standard size – maybe 5/8″-18? Thanks for another great read! Reminds me I need to get a power cord and get back to refueling mine.